Citation Information: J Clin Invest. 2006;116(3):695-702. https://doi.org/10.1172/JCI27009. LPS inhalation caused a significant recruitment of PMN into the BAL. In CXCR2–/– mice, PMN recruitment was completely abolished. In mice heterozygous for the CXCR2 allele (CXCR2+/–), a reduction of ~50% was observed. Data are mean ± SD of n = 6 mice in each group. 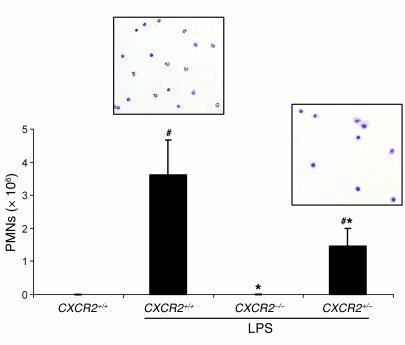 Cytospins of LPS-exposed BAL in CXCR2+/+ and CXCR2–/– mice are shown above the corresponding bars. *P < 0.05 versus CXCR2+/+; #P < 0.05 versus no LPS.